The machine base is a tabletop design fitted with a laminated mica top on sturdy cast iron legs with steel pipes/angles providing the necessary support. 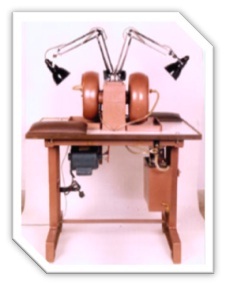 The machine is fitted with 3 housings in a cast iron base bolted to the tabletop. 1/2 h.p. 1440 r.p.m. Single-phase 220 volts motor AC 50 cycle. This motor is fixed on a removable base plate. The three housings contain separate shafts and pulleys driven by the same motor. One housing is used for fixing the diamond coated grinding lap of 8″ dia. The other two housings are for fixing the polishing lap of 8″ dia. The machine comes with six faceting equipment, which help in maintaining the angles. Each of these facetors has a cheater adjustment for fine tuning the alignment. The dop sticks are fitted with the indexing attachment. We also make other models called AEW-FPIT(2) which comes with 2 faceting equipment and one housing. and AEWFPIT(4) which come with 4 faceting equipment and three housings. All other things are the same. The machine comes fitted with light attachment and arm rests. The coolant attachment is optional. This is the most versatile faceting and polishing machine for Gems. 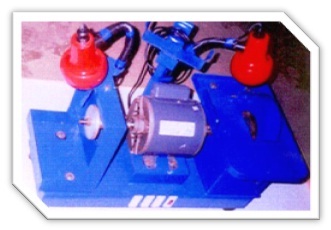 This is an ideal machine for mass production of gems wherein the work is dived between Four operators. Two operators are faceting the stone sand the other two are polishing the stones. The Gemstone is fixed on to the Brass dopstick with the help of dopping wax. This dipstick comes with an indexing attachment. One end of the dop stick has the stone and the other end of the dopstick is rested in the respective slot provided in the facetor unit. These slots provide for different angles at which the stone is required to be cut and polished. The indexing attachment on the dop stick is rested and supported against the cross arm of the facetor. The indexing attachment is operated to get the different facets. Once the faceting is complete, these dopsticks are handed over to the operators who will be polishing these Gems on the polishing lap for achieving polish on the facets. The facetors are so aligned with each other that the full facet is polished on the polishing lap exactly as it has been cut on the grinding lap. 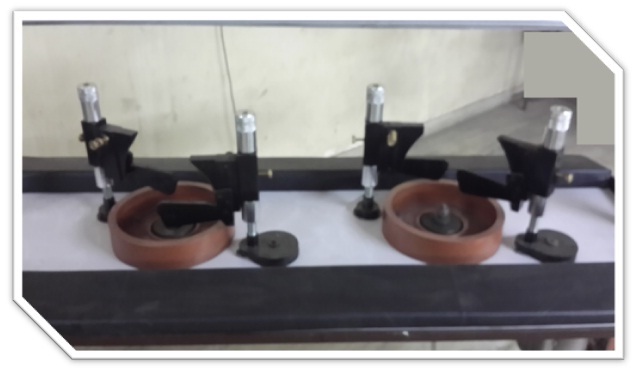 The grinding lap, the polishing lap, dopsticks, dopstick stand, transfer block, and coolant attachments are not provided with the machine. The indexing attachment is fitted on the dop stick itself and as such this affords a full view of the stone. This machine is best suited for mass production of Gems. Also the individual expertise of the operator with respect to faceting or polishing can be best utilized to make them do what they are better at.